The Comby 9000 steam is super heated to 180°C and then delivered at 8 Bar, together with a powerful 1400 Watt vacuum cleaner, making this the ultimate super cleaner. 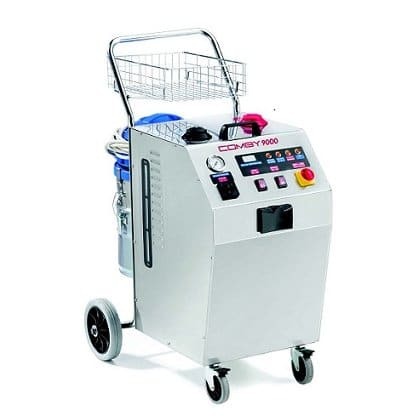 The Comby 9000 steam cleaner enables either simulataneous or independant use of the industrial-strength vacuum or the super heated steam facility, which is controlled easily on the steam handle. The 2 x 3.8 litre boilers generate 15kg of water per hour, which ensures the highest quality of cleaning and a sanitized hygienic finish. This machine has a unique feature, which allows the addition of detergent to the dry steam, making even easier work of the toughest cleaning tasks. It has a 5 litre detergent tank with an extra filler cap from which cleaning agents, such as detergents or mild solvents, can be utilized in the cleaning process. A seperate detergent control is provided on the machine which allows for the easy release of detergent when it is needed for extra tough jobs. The unique continuous refilling function means that you can use the machine continuously without having to leave it to cool down whilst refilling. 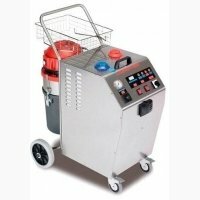 This machine has 2 x 3.8 litre boilers, a 5 litre detergent tank and a massive 15 litre refilling tank; making it ideal for long periods of use. Brass Jet For durability, will clean all grouting and hard to reach areas of kitchens and bathrooms. Brushes can be fitted for agitation.